Samsung's already made the Galaxy A30 and A50 official, but there are more members of this family on the way, double digit names and all. One of those is the Galaxy A60, but there's also apparently a Galaxy A70 and a Galaxy A40 coming. The Galaxy A60 is the star of the newest leak today, which purportedly shows us the main selling points of this upcoming device. 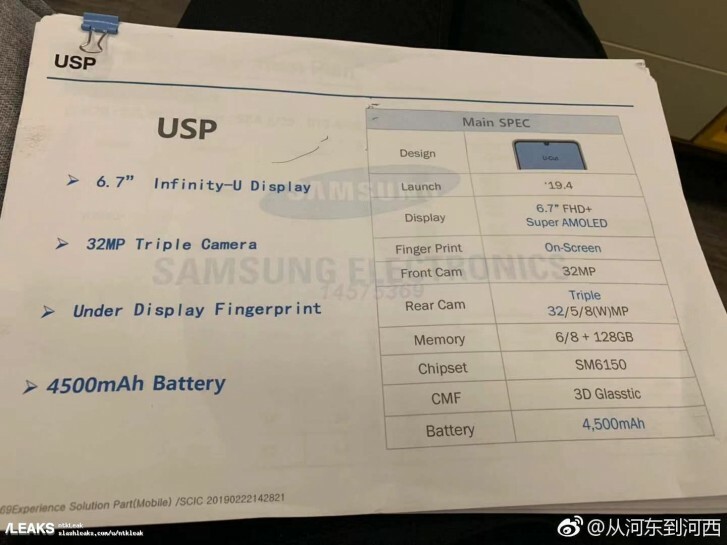 If this is real, then expect the handset to don a 6.7-inch Super AMOLED touchscreen with FHD+ resolution (probably 1080x2340 if we go by the A50's setup) and a water drop notch (what Samsung calls an Infinity-U panel). Additionally, an in-display fingerprint sensor should be in, as well as a 32 MP selfie camera. On the back there will be a triple shooter setup, with one 32 MP main camera, an 8 MP ultra-wide-angle lens, and a 5 MP snapper that we assume is just a depth sensor to aid in the creation of bokeh. For RAM you'll have two options - 6GB or 8GB, while storage will be 128GB no matter what. The Galaxy A60 will be powered by the Snapdragon 6150 chipset, and the lights will be kept on by a beefy 4,500 mAh battery. The phone is expected to run Android 9 Pie with Samsung's One UI on top. Really? That's both hilarious and sad. Well, sony still supplying 10w charger for their flagships. Conpare to this, 15w is a fast charger lol.